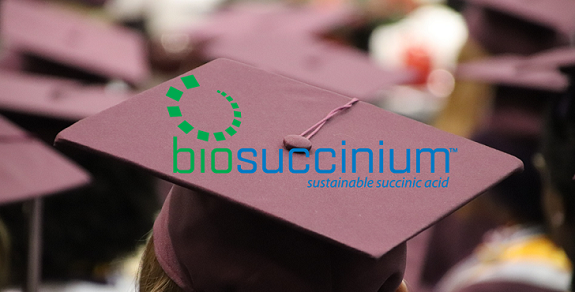 In the Netherlands, there is a big change coming for bio-succinic acid production, a graduation of sorts for Biosuccinium. Since 2012, Reverdia’s parent companies — Royal DSM, a global science-based company in Nutrition, Health and Sustainable Living, and Roquette, a global leader in plant-based ingredients for Food, Nutrition and Health markets, — have been producing bio-succinic acid with the trademark name Biosuccinium under a joint venture agreement. But that’s all about to change as they decide on a strategic shift in the continuing operations of their joint venture and dissolve it. First, a quick primer on what it is. Bio-succinic acid is a platform molecule – a dicarboxylic acid – with applications in a range of large-volume markets. The name derives from Latin succinum, meaning amber, which may remind you of the company called BioAmber, a producer of biosuccinic acid that closed down last year, as reported in The Digest. It can be used as a precursor to polymers, resins, solvents and is used in the automotive and electronics industries quite a bit and can also be used as a food additive, flavoring agent, and dietary supplement. Biosuccinium – the Reverdia trade name version – is the first non-fossil feedstock derived chemical building block that allows customers in the chemical industry to choose a bio-based alternative with a lower eco-footprint for a broad range of applications, from packaging to footwear, according to their website. Check out “Succinctly succinic: The Digest’s 2018 Multi-Slide Guide to Reverdia and bio-succinic acid” for more. Effective 1 April 2019, the joint venture Reverdia will be dissolved and the partners will transfer the rights and obligations related to Reverdia’s Biosuccinium plant in Cassano, Italy to Roquette. Under a non-exclusive license from DSM, Roquette will operate the plant and continue serving customers of Biosuccinium. Customer service, order processing, and marketing and sales will be integrated into Roquette’s existing business to ensure a smooth transition. DSM, the original developer of the Biosuccinium technology, will become the exclusive licensor to strategic customers and other third parties interested in the integration of the Biosuccinium production process into their value chains. So why is DSM dissolving the joint venture and moving away from bio-succinic acid? It’s all about moving a product past the start-up stage to commercial stage and then letting others take care of it. Kind of like having a baby – you nurture it, feed it, take care of it but one day it’s a big kid going off to college on its own and you have to say fly little birdy out of the mama and papa nest to live your own adventures. “After the success of the collaboration with DSM through the joint venture, we will integrate the Biosuccinium product line within our global business organisation. Our sales force will continue to support our customers’ growth,” says Bruno Plancke, Vice President of the Industry Global Business Unit at Roquette. The dissolving of the Reverdia joint venture is interesting for DSM as they have several other recent announcements that show they are focusing on other things and letting Roquette take over on Biosuccinium. DSM recently joined the Renewable Fuels Association (RFA) as a member and DSM is now starting up the first-of-its-kind on-site manufacturing of enzymes to supply Project Liberty – the joint venture with POET that is focused on advancing the production of cellulosic ethanol from various feedstocks. “DSM is excited to join the RFA. We are passionate about biofuels and continuing to work with the organization, members and stakeholders to support the industry and bring higher performance, robust solutions to the marketplace,” said Hans van der Sluijs, business director DSM Bio-based Products and Services. Another recent announcement is that DSM Venturing, Royal DSM’s investment arm, is investing in skin microbiome research – more specifically, it made an equity investment in skin microbiome company S-Biomedic NV, a Belgium based Life Sciences company pioneering a new approach to cosmetic and therapeutic potential of the skin microbiome. This investment completes S-Biomedic’s latest Series A financing round. This investment underlines DSM’s interest in the skin microbiome, an area it has identified as having significant growth potential. DSM already holds a strong position in gut microbiome research and solutions with its Culturelle product range. DSM Venturing has invested in more than 50 emerging innovative companies since its inception in 2001 and its current portfolio covers various industries. “DSM welcomes open innovation, as our history of investing in start-ups and taking on the role of incubator shows,” comments Rob Beudeker, Investment Director at DSM Venturing. So as DSM focuses on other areas to nurture and grow, like cellulosic ethanol and skin microbiomes, it is saying goodbye to biosuccinic acid as it graduates from beyond start-up to commercialization and moves on to its next adventure. We see this as a big move for DSM in that while it retains its role as exclusive licensor to it, it is a proud papa realizing there are some things you watch grow and then let go of so it can reach its next phase in life.